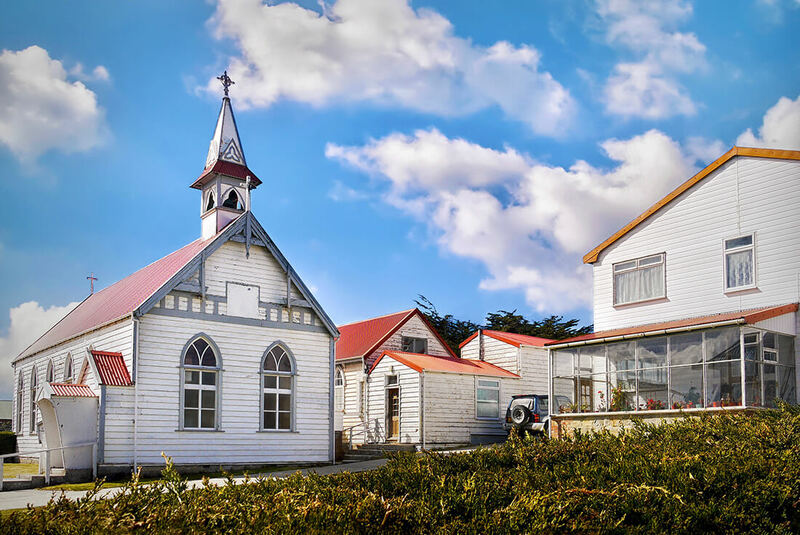 https://www.intrepidtravel.de/falkland-islands-malvinas/antarctic-peninsula-falkland-islands-south-georgia-from-buenos-aires 423325 Antarctic Peninsula, Falkland Islands & South Georgia: From Buenos Aires https://www.intrepidtravel.de/wp-content/uploads/2017/05/8805928861726.jpg https://www.intrepidtravel.de/wp-content/uploads/2016/05/8799002460190.gif 10200 EUR InStock 20 /polar//suedamerika//antarktis//argentinien//falkland-islands-malvinas//polar-2//comfort/	Experience an adventure tour of Antarctica and explore the unique conditions at the end of the Earth. Embark from Ushuaia and travel through the Beagle Channel to the Falkland Islands, where a treasure trove of bird life and cheeky penguins put on a show on the rocky shores. Then head through the Antarctic Convergence on the way to South Georgia, and get your first taste of Antarctic life on this remote island made famous by Shackleton. Incredible icy bays, abandoned whaling stations and an abundance of noisy wildlife are just some of the sights to greet you before sailing further along the Antarctic Peninsular to spend days exploring the area on zodiacs, witnessing ethereal icebergs and soaking in the incredible landscapes and wildlife of Antarctica. Benefit from the navigational expertise and local knowledge of a professional crew and make the most of this once-in-a-lifetime experience. Welcome to Buenos Aires. Begin your Antarctic Explorer adventure with an overnight stay in this Argentinian metropolis and explore its sophisticated streets. Meet your shipmates at the hotel in the evening for a welcome meeting. Please look for a note in the hotel lobby or ask reception where it will take place. We’ll be collecting insurance details and next of kin information at this meeting, so ensure you bring these details to provide to your leader. If you’re going to be late, please inform hotel reception. While at sea, you’ll be kept busy by your expedition team, who will prepare you for the adventures to come. The team may include marine biologists, historians, geologists and more. Enjoy on-board presentations about the history and wildlife of Antarctica. Your first encounter with land after being at sea will be the Falkland Islands (Islas Malvinas). This area is packed with birdlife so you’ll be able to use your newfound knowledge to identify particular species of animals. Look out for Magellanic, gentoo and rockhopper penguins, Black-browed albatross and two endemic bird species – Cobb’s wren and the Falkland’s flightless steamer duck. Meet the friendly local residents and explore the islands on daily Zodiac landings. The 8 km long (five mile) island, northwest of West Falkland, belongs to Rob and Lorraine McGill. It’s a picturesque island, where songbirds nest among the luxuriant growth that covers the gently rolling landscape. The island is named after a Royal Navy ship, the HMS Carcass, which arrived in 1766. CROSS COUNTRY SKIING – Cross-country skiing is one of the most efficient ways to travel over ground that is covered in snow and ice, enabling you to travel in Antarctica the same way that pioneering explorers like Amundsen and Shackleton did. With journeys taking a few hours, it is imperative to be in good physical shape. Ideally, you’ll have cross-country skiing experience to partake in this activity, however exceptions may be made for those deemed physically capable. While Quark provides the essential gear, you will be responsible for certain extras such as additional warm clothing and a pair of good sunglasses. STAND-UP PADDLEBOARDING – Combining surfing with kayaking or canoeing, stand-up paddleboarding will give you a very personal and unique perspective on Antarctica. This activity is taken in small groups in good weather conditions on calm bays and harbours, with a Zodiac following for your safety. SNOWSHOEING – A novel way to experience the beauty of the polar landscape, and discover remote alcoves and hidden valleys. The rewards of walking atop the snow are well worth the effort, as we’ll be able to visit new places that may be inaccessible on foot. This traditional means of transport across the snow comes from the indigenous people of North America. While you can appreciate a connection with the past, the snowshoes we use today are much lighter and more forgiving than the old wood-weave snowshoes used during the days of the North American fur trade. 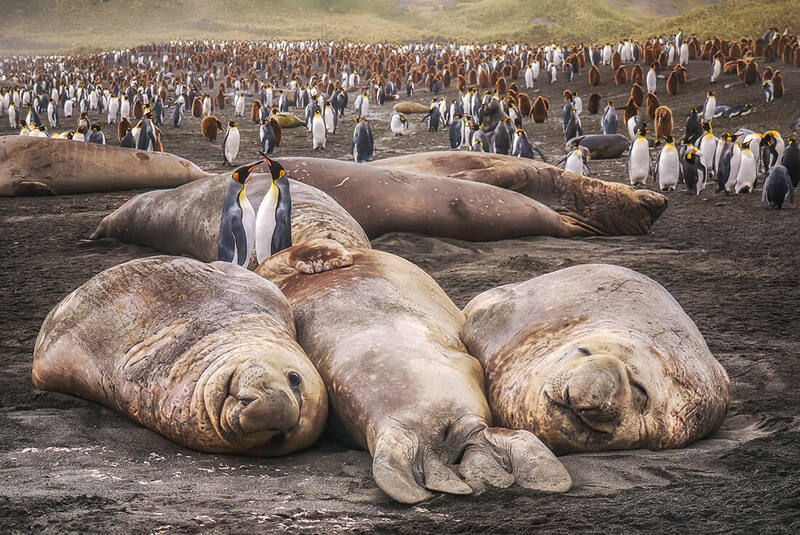 PHOTOGRAPHY – Antarctica is one of the most abundantly photogenic destinations in the world. Penguins amble across pebbled beaches, whales spy-hop from the crystal blue sea and sparkling icebergs tower in this serene, yet dramatic environment. Whether you own a serious SLR or a simple point-and-shoot, our on-board photography expert provides you with hands-on instruction and technical tips to ensure that you capture the best of your Antarctica experience. Jagged mountains erupting from the sea, your first sight of South Georgia is spectacular. Once ashore, you might hear a chorus of barking and squealing seals and penguins. Planned activities over the next few days include a series of landings at king penguin rookeries and abandoned whaling stations. Keep an eye out for albatross and petrels, and don’t be surprised if you spot the odd reindeer, as these were introduced by Norwegian whalers in the early 20th century. Perhaps visit Sir Ernest Shackleton’s grave at the abandoned whaling station of Grytviken. As landings are dependent on weather and ice conditions, please be aware that plans may change with little notice. By now you should have reached the Antarctic Peninsula. Your expedition team will make sure that your four days here are filled with varying landscapes, wildlife encounters and activities. Perhaps take a ‘polar plunge’ into the ice-cold waters of Neko Harbour, scramble to the top of a craggy hill for panoramic views of the area or witness a glacier calve into the sea near Danco Island while on a Zodiac cruise. Chinstrap, Adelie and gentoo penguins are found here, along with Weddell, fur, crabeater and leopard seals. Curious whales, such as minkes, are often attracted to Zodiacs, giving you the chance to get right up close to these majestic animals. Perhaps partake in an optional sea kayaking adventure (at an extra cost and subject to availability). Every day along the peninsula will provide unique experiences. If you’re lucky enough to mail a postcard in Antarctica, you’ll likely pass through Damoy Point. This is the northern entrance to the harbour on which Port Lockroy is located. This bay was once used by the floating whale factory ship Neko. You may see some whale vertebrae used by resident gentoo penguins as shelter from the wind. There’s an unmanned refuge hut here, erected by Argentina. Climb past the hut and up a steep slope for spectacular views of the glacier-rimmed harbour. Journey to Port Lockroy if weather permits. The harbour is on the west side of Wiencke Island. A secret base was built here during the Second World War as part of Operation Tabarin. It’s now designated as a historic site, featuring a museum and the world’s southernmost post office. Proceeds from your purchases here support the preservation of historic sites from the Heroic Age of Exploration.